Residential & Business Rubbish Removals UB5 Greenford | RDA Cleaning & Maintenance Ltd.
You have some rubbish that you need to be taken care of? Don’t worry we have it covered. RDA Cleaning & Maintenance Ltd. is a professional waste disposal company, specialized in rubbish removal Greenford UB5 services. All the services that we provide are great for both residential and commercial clients and are in accordance with the British waste management requirements. Our vetted professionals do their best on the job. That means that our company can guarantee you a high-quality service thanks to them. But not only are our service of the highest quality, they are at affordable prices as well. All our waste disposal Greenford UB5 services will be done in the most discrete manner without the need of stopping your work. We also provide construction waste services that include builders clearance and removal of refurbishment waste. RDA Cleaning & Maintenance Ltd. is an experienced rubbish removals company with big potential to become a leader in market. We have been in the industry for more than a decade. This is the time we have learned to be always in time and in the service for each individual customer. Being appreciated for our qualitative job today 96% of the feedback we receive is positive. We also offer some of the lowest prices in the field. 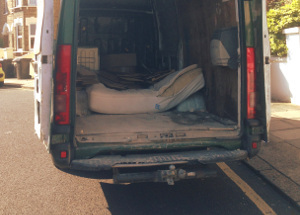 Our Greenford UB5 rubbish collection service price includes the transportation fees, too. Our high quality waste disposal service in Greenford UB5 is a complex procedure with specific chores and actions to handle depending on the property and the junk type we face. In all cases, we promise to execute the service fast and safely. Once the service is arranged for you, expect urgent visitations by our expert and trained technicians. They come to your property for a check in advance. According to the volume and the type of the rubbish, we provide you an offer and free quotation. A plan for the entire service is also offered to the customer. Once you agree, we get ready to remove your junk as soon as possible! Make the right and smart decision - call the commercial and residential rubbish removal Greenford UB5 specialist at 020 3404 1646! Get rid of that junk at affordable rates and without even sweating. Our reliable rubbish removal company guarantees great final outcome and promises full satisfaction for all our clients!